WASHINGTON — The fight between Sen. Ted Cruz and challenger Beto O’Rourke pits a tea party darling who used his first term to run for the White House against a dynamic three-term congressman hoping to snap his party’s 25-year losing streak in Texas. Both cleared the primaries on Tuesday with little resistance, and even before polls closed, Cruz was framing the race as a bid by “angry” Bernie Sanders-style liberals to attack Texas’ conservative values. O’Rourke shrugged off the label and said that like voters, he’s focused on jobs, a living wage, education and affordable health care. “Can you define any of that on the political spectrum?” he said. The last Democrat to represent Texas in the Senate was Bob Krueger, an appointee who kept the seat warm for five months in 1993 after Democrat Lloyd Bentsen resigned to serve as Bill Clinton’s Treasury secretary. Kay Bailey Hutchison ousted Krueger in a special election. Cruz took over when she retired in 2012, after an upset win over then-Lt. Gov. David Dewhurst in the primary. They largely agree on support for free trade and NAFTA. But they diverge on Obamacare, immigration policy, border security and taxes. Cruz touts a top grade from the NRA and tweaked O’Rourke for earning an F over his support for restrictions on high capacity magazines and assault-style weapons. Where O’Rourke accuses Cruz and Trump of a heartless approach to immigration and a foolish call for a border wall that would mainly antagonize a key trading partner, Cruz hits back that the Democrat supports open borders and amnesty for undocumented immigrants. O’Rourke, too, said he looked forward to debating his rival in coming months. He contrasted his support for universal health care with Cruz instigating a 16-day government shutdown in 2013 in a bid to defund the Affordable Care Act. “Ted Cruz leaves Texas and is campaigning in Iowa and is in New Hampshire, and he boasts of having visited every one of the 99 counties of Iowa,” O’Rourke said. In the primaries, Cruz faced Houston energy lawyer Stefano de Stefano, Christian TV producer Bruce Jacobson Jr., accountant and self-described moderate Mary Miller, and former La Marque mayor Geraldine Sam. O’Rourke faced Sema Hernandez, who described herself as a “progressive Berniecrat,” and retired postal worker Edward Kimbrough. O’Rourke has raised more than $8.7 million since declaring his candidacy last March, topping Cruz in that same period. In the first six weeks of 2018 alone, he outraised Cruz $2.3 million to $800,000 — a wake-up call for Republicans who had assumed that Texas would remain a dependable fortress. Still, Cruz enters the general campaign with a $6 million war chest, an edge of more than $1 million. Outside groups on the right and left could pour money into Texas if they smell opportunity. But the party committees are likely to remain on the sidelines. With roughly 20 media markets in Texas, they can get more bang for the buck elsewhere. Cruz enters the race with near universal name recognition, but also a reputation as a polarizing figure. He adamantly refuses to accept responsibility for the 2013 shutdown, an episode that propelled his presidential aspirations, cementing the affection of conservatives and making him a reviled adversary for the left. O’Rourke, by contrast, opened this campaign unknown beyond his El Paso base, far from the vote-rich regions around Dallas and Houston. 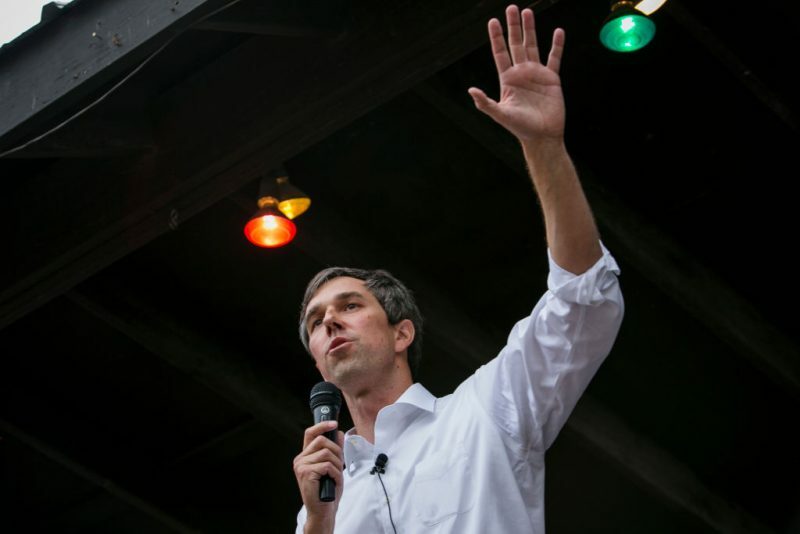 He has barnstormed Texas for months, drawing surprisingly large crowds in small and medium-sized cities that statewide Democratic candidates have neglected for years — though retail scale politics has limits in a state so vast. “This is as simple and direct as democracy can get,” he said, adding that he plans to continue that approach. But even if O’Rourke “looks like a Kennedy” and makes voters swoon with support for term limits and “doesn’t sound like a prepackaged candidate,” said Steinhauser, his chances hinge on “huge turnout” among Democrats. Cruz has tied himself unabashedly to the divisive president and said Tuesday night that he welcomes Trump’s support.